The Bering Strait is about 82 kilometres (51 mi) wide at its narrowest point, between Cape Dezhnev, Chungu Peninsula, Russia, the easternmost point (167° 42' W) of the Asian continent and Cape Prince of Wales, Alaska, United States, the westernmost point (164° 15' W) of the North American continent. Its depth varies between 30 metres (98 ft) and 50 metres (160 ft). It borders with the Chukchi Sea (part of the Arctic Ocean) to north and with the Bering Sea to south. The earliest reference of the strait were from maps from the Polo family, based on the adventures of Marco Polo. From at least 1562, European geographers thought that there was a Strait of Anián between Asia and North America. In 1648, Semyon Dezhnyov probably passed through the strait, but his report did not reach Europe. Danish-born Russian navigator Vitus Bering entered it in 1728. In 1732, Mikhail Gvozdev crossed it for the first time, from Asia to America. Adolf Erik Nordenskiöld in 1878–79 sailed along the northern coast of Siberia, thereby proving that there was no northern land bridge from Asia to North America. Between August 4 and 10 (US time), 2013, a team of 65 swimmers from 17 countries performed a relay swim across the Bering Strait, the first such swim in history. They swam from Cape Dezhnev, Russia, to Cape Prince of Wales, United States (roughly 110 kilometres (68 mi), due to the current). They had direct support from the Russian Navy, using one of its ships, and assistance with permission. During the Cold War, the Bering Strait marked the border between the Soviet Union and the United States. 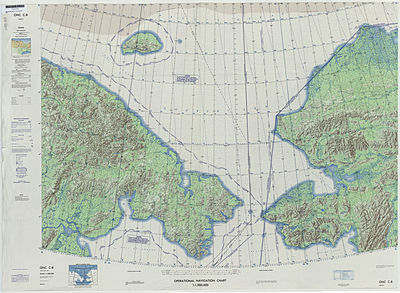 The Diomede Islands—Big Diomede (Russia) and Little Diomede (US)—are only 3.8 km (2.4 mi) apart. Traditionally, the indigenous peoples in the area had frequently crossed the border back and forth for "routine visits, seasonal festivals and subsistence trade", but were prevented from doing so during the Cold War. The border became known as the "Ice Curtain". It was completely closed, and there was no regular passenger air or boat traffic. In 1987, American swimmer Lynne Cox symbolically helped ease tensions between the two countries by swimming across the border,  and was congratulated jointly by Ronald Reagan and Mikhail Gorbachev.